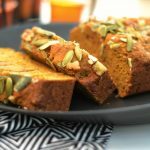 If you like the Starbucks pumpkin bread, you will love this version. Make sure to take some to the office. Everyone loves it! Sprinkle the top of each loaf with the walnuts and pumpkin seeds. You might want to gently press them into the batter (not too deep) to make sure they bake in just right.